Discussion of the difference between plot and story in Alfred Hitchcock's Vertigo . Hitchcock and screenwriter Samuel Taylor were both aware of the gaping hole in the plot, and yet it's the emotional story of the characters played by James Stewart and Kim Novak that make this one of Hitchcock's greatest films. There are spoilers in this video, proceed with caution! 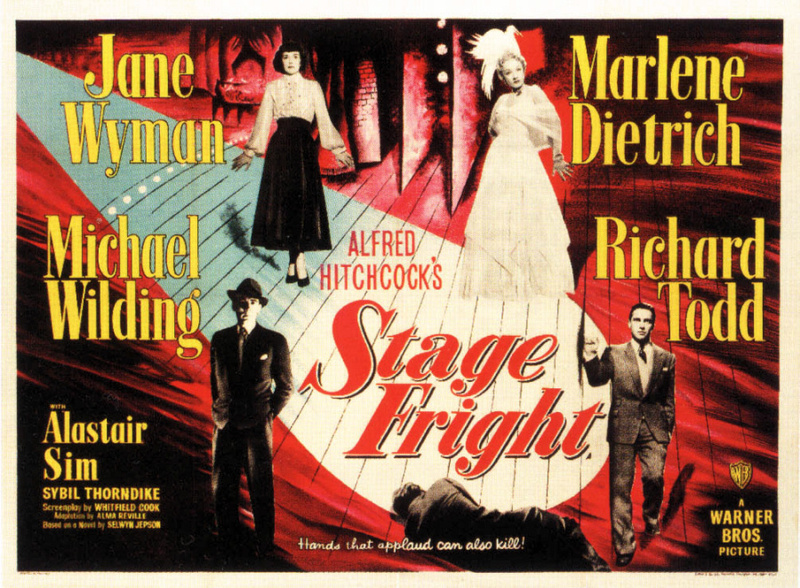 Alfred Hitchcock had few kind words to say about Stage Fright . But one can learn a great deal more from one of Hitchcock's misfires than from many other filmmakers' best works. 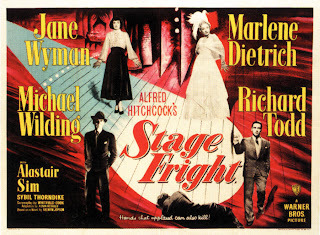 In the case of Stage Fright , Hitchcock and his writers—which included his wife, Alma Reville, Whitfield Cook, Ranald MacDougall and James Bridie—erred on three distinct points in adapting Selwyn Jepson's Man Running (aka Outrun the Constable) to the screen. First and foremost, the film's writers chose to ignore one of three triangles from the novel. In the film there are two triangles that come into play. 1) Eve/Jonathan/Charlotte and 2) Eve/Jonathan/Smith. Initially, Eve is threatened by, and in some respects jealous of, the power that Charlotte holds over Jonathan with whom Eve is clearly infatuated. As the film progresses though that triangle becomes less significant as Eve grows closer to Detective Smith. Late in the film Eve remains determined to exonerate Jonathan, but her romantic leanings have clearly shifted to Smith who at least is sending reciprocal signals. In the novel, however, a third triangle becomes particularly important near the end—that of Charlotte/Jonathan/Freddy Williams. Unlike in the film, Charlotte's lover, Freddy Williams, is the killer in the novel. In order to protect Freddy, Charlotte sends Jonathan to her flat to retrieve a dress. When Eve confronts Charlotte and Freddy with her suspicions, Freddy tries to silence Eve—permanently—making for some suspenseful moments as Eve puts herself in genuine danger in order to clear Jonathan. This brings us to the film's second flaw. The writers gave their script a weak villain in Jonathan Cooper (Jonathan Penrose in the novel). That he is the unwitting dupe of Charlotte Inwood is consistent with the novel, where it is in fact Charlotte and Freddy Williams who are the pair responsible for the murder of her husband. In the film though, Hitchcock and his writers chose to make Jonathan responsible, and in what can best be described as an eleventh hour twist that goes against everything that has come before, the writers establish not only that Charlotte seduced Jonathan to murder her husband, but that he in fact had killed before, and therefore Eve is now in danger! The screenwriters' choice to build tension in the film's final moments by transforming Jonathan from Charlotte's pawn to an outright psychopath becomes difficult to swallow, and is directly linked to the film's fatal flaw—which resulted in the need to abandon a long-planned humorous ending. We FADE IN once again on the stone sign 'Royal Academy of Dramatic Art'. We LAP DISSOLVE to a CLOSE SHOT of Eve in another man's arms - they are in the midst of a rather powerful love scene. Eve is doing it extremely well. The CAMERA pulls back revealing the small Royal Academy stage and the dramatic coach, who is sitting in front. The latter stops the scene and compliments Eve on the marked improvement in her acting. She tells her to run over the scene again. Eve acknowledges the compliment and starts again. The scene contains many terms of endearment and kisses. We turn the CAMERA around and show a few students and others watching this rehearsal, - the CAMERA moves in until it comes to a close-up of Smith, who is watching this passionate scene with an extremely glum and pouting expression.. So this is what it's going to be like married to an actress! "So, you see, my advice to budding actresses is to get mixed up in a nice murder case. This idea in the treatment was then scripted in a number of ways, one by the writer Ranald MacDougal, which takes place in the rehearsal hall. Again we see the stone sign 'ROYAL ACADEMY OF DRAMATIC ART'. Eve is in the arms of a strange very tall blonde young man. She is playing a love scene, and doing it extremely well. "But I do understand. I know all the fear and horror you must have gone through, my darling….And I only wish that in some small way I could have - saved you from yourself, saved you from your tragic fate..."
Very nice, Eve. Very nice indeed. For some mysterious reason, your acting has improved enormously…Shall we do that little scene again? "Oh, my darling, I thought I'd never see you again! - Hold me close. Close!..." "I love you so terribly ... my dearest..."
"What can I do to help you? Where will they take you tomorrow?" "I don't know. Oh, Helen, I feel I've been so weak…But you can't understand what torture these months have been..."
Smith is now almost pouting - so this is what it's going to be like, married to an actress! EXT. ROYAL ACADEMY OF DRAMATIC ART. CLOSEUP. "ROYAL ACADEMY OF DRAMATIC ART"
Half a dozen girls dress in this room and there is a confusion of make-up boxes, dresses etc. THE CAMERA searches for Eve and finds her, alone in the room, dressed in under- clothes. She is doing violent exercises of some kind and has obviously got an attack of nerves. Hip bath. Hip bath. Hip bath. There is a knock in the door. CAMERA PULLS BACK to show Smith entering. I can't speak to you now. Chubby enters like a whirlwind. Darling, they forgot to call you and you're practically ON. Where's your dress? Chubby throws Eve's dress over her head and fastens it while Eve tidies her hair in front of the mirror. I can't possibly talk to you. There are three producers in front. And I'm late and it's my big scene. Smith takes a ring from his pocket. Eve looks adoringly at Smith then rushes out of the dressing-room followed by Chubby and Smith. Eve running, pursued by Chubby, fastening hooks. She holds out her left hand toward Smith who is following her. He slips the ring on her engagement finger. She kisses him and he smiles happily. INT. WINGS OF R.A.D.A. STAGE. A student Stage Manager and Miss Ashton in a panic as Eve arrives still holding Smith's hand - followed by Chubby. Miss Ashton looks disapprovingly at them. It's no good being sorry. There's your cue. Go on. INT. R.A.D.A. STAGE FROM THE WINGS. MEDIUM SHOT. Eve rushes on stage into the arms of the Bald Young Man. Oh, my darling ! At last ! At last ! CAMERA MOVES TO CLOSE UP of Smith in the wings. His face loses its pleased expression during Eve's speech. Smith's face shows some lack of appreciation for these sentiments. Ultimately, as much as Stage Fright grapples with retaining a light tone and humor throughout, once Eve drops the play-acting, and has to experience real emotions to get Charlotte to implicate herself in the murder, and once Jonathan goes full psycho and is killed, it was impossible to swing the pendulum back toward a humorous ending.